Mahoney’s Garden Center is a family-run branch company who first opened in the state of Massachusetts in the year 1959. They are located in eight Massachusetts towns: Winchester, Tewksbury, Wayland, Concord, Brighton, Falmouth, Osterville and Chelmsford, as well as a growing facility in Woburn. The Mahoney’s store in Chelmsford is located off to the side of a busy road. The location allows for easy access for people driving by to turn right into the parking lot. 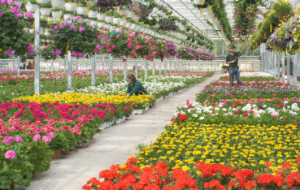 On top of the plants and annual flowers, Mahoney’s provides a selection of bags of planting mix, as well as bags of mulch, depending on what the customers are looking to work on. In the town of Woburn Massachusetts, Mahoney’s grows their plants locally during every season. The plants are grown in extra large pots that promote bigger, healthier root systems. Growing locally also keeps jobs local and reduces the fuel emissions needed to truck plants in from far away. Since customer care is very important, Mahoney’s provides the option of rewards cards. Mahoney’s Rewards is a free club where customers earn points every time they shop at one of the stores. Points are earned by every dollar you spend. This program works best for regular customers. When customers reach 250 points, five dollars is taken off their purchase. Other benefits include: exclusive sales, special offers and discounts. Automatically sent Emails provide advance notification of Mahoney’s popular sales, private invitation and events. Personal customer’s information is not shared with anyone. During the New England winter season, the snow arrives around November and usually doesn’t end until early/mid March. The Chelmsford Mahoney’s location is four minutes away from Drum Hill Business District. Mahoney’s employees have the responsibility of shoveling snow away from businesses, sidewalks, clearing snow away from company dumpsters. Employees toss healthy amounts of ice melt onto the sidewalk pavement, around dumpsters, and behind business’. The ice is then thawed, which in turn allows the pavement accessible to walk on. During the early winter season (late November – mid/late December) Mahoney’s brings in a large truck filled with Christmas trees to be unloaded. The trees are then divided by variety. A benefit for the employees are the tips they make from helping customers with finding and prepping their trees to be tied onto vehicle roofs or placed into the back of the vehicle. Mahoney’s is all about serving and contributing to the community: through reward cards, the variety of plants offered, plant care, a diverse choice of garden products, Christmas trees and customer benefits. All year round, Mahoney’s is dedicated to provide the best service. The community continues to do business with Mahoney’s because they trust the company’s dedication.